The first Bombardier Global 5000 business jet (serial number 9127) successfully completed its first flight on 7 March 2003. 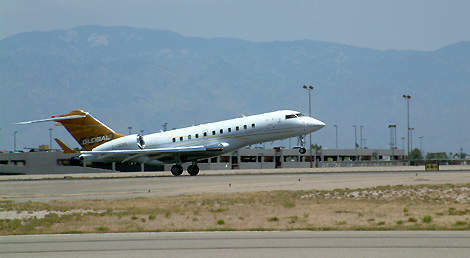 The first Global 5000 business jet takes off from Bombardier's Tucson completion centre, en route to its public debut in White Plains, New York, on 11 June 2003. 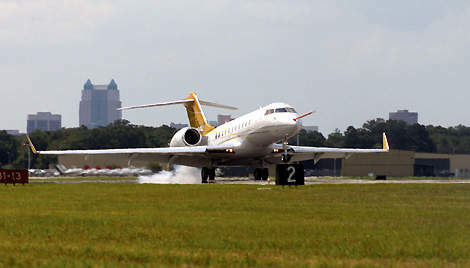 The Global 5000 super-large business jet landing at Orlando Executive Airport for its debut at the National Business Aviation Association (NBAA) Convention in October 2003. The Global 5000 is capable of flying non-stop from continental Europe to central North America at Mach 0.85 with eight passengers. The Bombardier Global 5000 is a super large business jet which, with a range of 8,889km (4,800nm), is capable of flying directly from continental Europe to Central USA at high speed. The aircraft has a maximum cruise speed of Mach 0.88 (935km/h). The Global 5000 design is a development of the proven high-reliability Global Express corporate business jet with a smaller airframe. The take-off and landing strip requirements allow operators to land at smaller airfields closer to business areas. A balanced field length of just 1,525m (5,000ft) is required for a maximum-range mission of 8,889km at speed Mach 0.85. 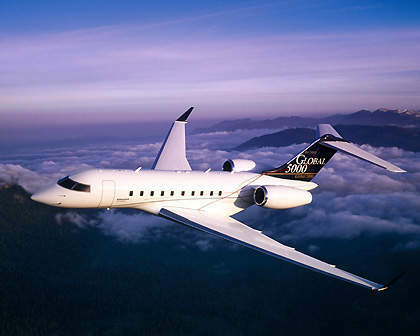 Bombardier Aerospace started a market evaluation and design study for a new long-range, high-speed business jet in 1999 and, by February 2002, the Global 5000 aircraft was formally launched. Shortly after the announcement of the development programme, the TAG Aeronautics company placed the first order for the aircraft. 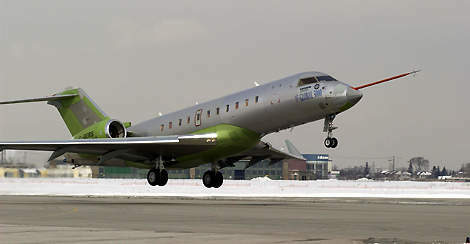 The Global 5000 took its maiden flight in March 2003. Transport Canada (TC) type certification was received in March 2004, European Joint Aviation Authorities (JAA) in July 2004 and US Federal Aviation Administration (FAA) in October 2004. The aircraft entered service in April 2005, with a corporate customer in the Middle East. The aircraft complies with JAR OPS 1.245 ETOPS (extended-range twin-engine operation) 180 minutes guidelines for business jets. Over 60 Global 5000 aircraft have been delivered. In February 2008, Bombardier Aerospace announced that the range of the Global 5000 had been extended by 741km to 9,630km. This has been achieved by raising the maximum take-off weight (MTOW) to 41,957kg, allowing a higher fuel capacity. The range increase will be standard on all production aircraft from 2012. In June 2005, the Global 5000 set a new speed record for a business jet by flying 6,500km (3,510nm) non-stop from Chicago to Paris in seven hours 15 minutes. The aircraft had four crew plus a 727kg payload (equivalent to eight passengers) and cruised at Mach 0.88. In June 2011, a Bombardier Global 5000 equipped with an Electro-thermal Ice Protection System (EIPS) carried out several flight tests in icy conditions in Alaska. 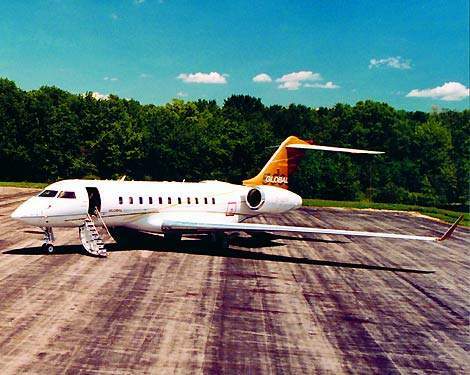 In October 2004, the US FAA ordered a Global 5000 for use as an airborne laboratory for flight testing. The aircraft was delivered in October 2005. 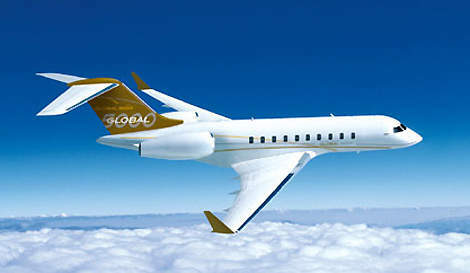 Bombardier delivered the first Global 5000 in mainland China to Reignwood Group in July 2009. The first Global 5000 aircraft was delivered in Argentina to an unidentified customer in June 2010. Qatar Airways placed an order for two aircraft in July 2010. The first was delivered in December 2010 and the second is scheduled to be delivered in 2011. MNJ Jet signed a contract for one Global 5000 in September 2010. In November 2010, Formula One champion Niki Lauda’s NL Holding placed an order for one Global 5000 aircraft with the new Global Vision flight deck. The aircraft is scheduled to be delivered in 2012. 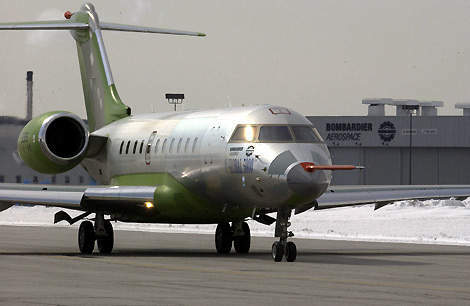 The 100th Bombardier 5000 entered into service with US-based Heritage Aviation in March 2011. Bombardier delivered the first of four Global 5000 jets to the German Ministry of Defence’s (MoD) Special Mission Wing in September 2011. The aircraft will be used for VIP transport and medical evacuation (MedEvac) operations. The ‘dark cockpit’ is ergonomically designed to minimise the pilot’s workload. The aircraft is equipped with a Honeywell Primus 2000XP avionics suite with dual flight management systems, dual Category II autopilot systems and an automatic flight control system. The dual electronic flight information system (E/FIS) has six 8in×7in multifunction displays. The navigation systems include a colour weather radar, triple laser gyroscope inertial reference system, global positioning system, automatic direction finder, an integrated VHF omnidirectional radio ranger / instrument landing system (VOR / ILS), distance measuring equipment (DME), TCAS II traffic alert and collision avoidance system and a ground proximity warner. "The Bombardier enhanced vision system (BEVS) will be available as an optional extra on the Global 5000 long-range business jet." 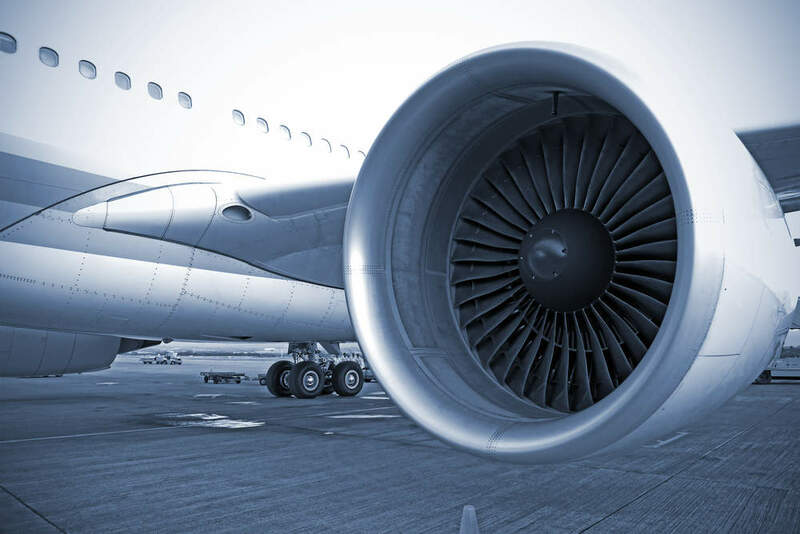 The aircraft is equipped with a Honeywell central aircraft information and maintenance system (CAIMS) which provides health, usage and service data, allowing faster maintenance turnaround times. Thales Avionics Canada and CMC Electronics (formerly BAE Systems Canada) have developed the Bombardier enhanced vision system (BEVS) which will be available as an option on the Global 5000. The BEVS, which integrates a 40°×26° Thales head-up display (HUD) and CMC’s SureSight infrared sensor, improves the pilot’s situational awareness in low visibility conditions. In September 2007, Bombardier announced a new Global Vision flight deck for the Global 5000 and Global Express aircraft. The Rockwell Collins Pro Line Fusion avionics suite includes: four high-resolution 15in diagonal active matrix liquid crystal displays (AMLCD), head-up guidance system (HGS), personalised display information, electronic checklist, maps with graphical flight planning, future air navigation system, controller-pilot datalink communication, RTA-4100 MultiScan weather detection system and synthetic vision system. It will also include the Bombardier enhanced vision system (BEVS). Global Vision recieived certification from Transport Canada (TC) in June 2011. The system will enter service on a Global Express XRS with launch customer London Air Services of Canada in 2012. The communications suite includes Rockwell Collins HF and VHF communications with dual radio management, a six-channel satellite communications system, a Coltech five-channel selective calling system and an emergency locator transponder. The aircraft is fitted with a Honeywell flight data recorder and cockpit voice recorder. A Teledyne Magnastar Office-in-the-Sky voice and data communications link can be installed. The cabin is customised to meet the operator’s requirement and can be configured for up to 19 passengers. A typical cabin configuration, providing a comfortable and productive working environment for up to eight passengers and three crew members, is arranged in three sections with a forward crew and staff rest area, a fully equipped office and a conference or state room. The air-conditioned baggage compartment at the rear of the cabin is accessible during flight. The cabin is luxuriously finished and provides an exceptionally quiet and comfortable flight. The cabin noise level is less than 52dB. The Rockwell Collins Airshow 21 integrated cabin electronics system provides digital Ethernet-based distribution of information for business connectivity. An integrated cabin diagnostic system manages the cabin environmental systems. Liebherr Aerospace Toulouse supplies the air conditioning and cabin pressure control system. The cabin interior has been designed by Bombardier and C&D Aerospace and features new seats with contoured back rests and armrests and, as an option, Visco Elastic cushions designed by Nasa. The cushions adjust to the individual passenger’s body shape when activated by body heat. Goodrich Hella designed the light emitting diode (LED) lighting. "Bombardier’s Global 5000 took its maiden flight in March 2003." The aircraft has two Rolls-Royce BR710A2-20 turbofan engines mounted at the sides of the rear fuselage. The engines, which are rated at 66.1kN at take-off, are equipped with full authority digital engine control (FADEC). The two-petal configuration thrust reversers are designed by International Nacelle Systems. The fuel system has a total capacity of 16,329kg of fuel and includes two integral wing fuel tanks, a centre-section tank and an auxiliary tank installed in the rear section of the fuselage. A fuel management system controls the flow and distribution of fuel. The single refuelling point is located in the starboard wing and fuselage fairing. The aircraft is equipped with a Walter Kidde Aerospace fire detection and fire extinguishing system. An auxiliary power unit, RE220GX from Honeywell, is installed in the tailcone and provides the power for starting the main engine. Messier-Dowty provides the integrated landing gear system.